Have you noticed all of the color-stick type lippies that are cropping up everywhere? So far, I have tried Tarte's Lipsurgence, Clinique Chubby Sticks, and Pixi's Tinted Brilliance Balms. There are drugstore versions as well! 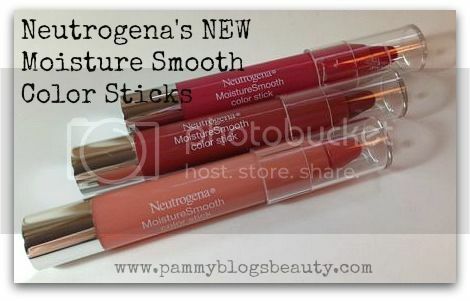 I know that Revlon has some and now there are also these new Moisture Smooth Color Sticks from Neutrogena! I really struggle with dry lips. So, any product that provides extra moisture is super intriguing to me! I just love the idea of hydrating lipcolor. I am so excited about the assortment that Neutrogena sent me to review! I got the following shades: Soft Raspberry, Juicy Peach, and Bright Berry. To hear more details and to see pictures, please keep reading! These Moisture Smooth Color sticks are like a super smooth lip-balm and hydrating lipcolor in one. They completely feel like a balm going on. Not like a waxy balm: these feel so silky! You can absolutely skip traditional lipbalm while using these! Normally I apply lipbalm before any lipcolor. With these, you can completely skip that step! Yay! Plus, you get beautiful super glossy shimmery semi-sheer color with a lightweight feel. Actually, it doesn't even feel like lipcolor. It just feels like a light layer of silky balm! Plus, you don't need a gloss on top either. These pack enough shine and shimmer to skip gloss! Of the colors that I tried, the Juicy Peach shade has a bit of a frosty finish. While that might turn some off, I personally love it! Product design features twist-up color. You don't need a sharpener! You just twist the color up from the silver base. The color is slightly sheer and super glossy! 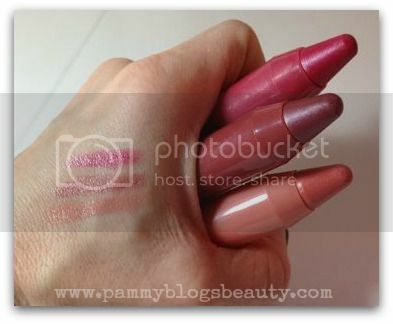 While it is on the sheer side, it still packs enough pigment to "change" your lipcolor. I just adore these Moisture Smooth Color Sticks! My favorite is the Juicy Peach shade. I wear it *all the time*! I know that I am going to continue to love these throughout Spring and Summer because of the lovey shine and lightweight feel. These Color Sticks are really like a lipbalm, lipcolor, and gloss in one. So easy to wear!